Hey y’all! It is crazy how we have already been in Peru for a couple of months now! I was thinking the other day how much I would’ve loved to hear what a day in the life looks like for a missionary doctor. And since I have already gotten so many experiences I want to share from my time here, I knew it would be a perfect post. Wednesday, 5:40 AM my alarm clock goes off, I hit the snooze just once thinking about how tired I am. Sidenote: Balance and rest is a must, for a worn out and burnt out doctor does no one any good. Since I am just getting settled into my position at the hospital, I have been told by several of the other veteran doctors to make sure to take time to rest and refresh. Even though the need is endless I must find balance. 5:50 AM my alarm goes off again… this time I struggle to find my wife’s face in the dark to kiss her before I roll out of bed to get my workout clothes on. Working out has quickly become a huge part of my balance here in Peru. It is a must. I find my way to the other side of the hospital campus from the guesthouse to the outdoor amphitheater area at 6 AM to meet Mark and Ben, my workout buddies. Today is the “power cardio” Insanity workout. It is brutal but oddly refreshing. 7:00 AM After workout I get back and make some eggs and cereal for breakfast. During breakfast I get to pray, since its Wednesday, I open my prayer app and get to praying for the unique needs and lives of close friends. 7:30 AM I make sure to shower and get ready quickly in order to make it into the hospital 30 minutes before our morning meeting to have some quiet time with God with my journal and Bible. Through journaling I tell God about how much I need Him, that this week I will need an extra dose of His strength to get me through the week and to help me be as understanding and loving with every needy person I meet. I read in the Bible how Jesus was surrounded by people in need and even got in boats to get some room to teach the clingy crowds on the shore. 8:00 AM sharp we are praying to start off the meeting. The meeting encompasses any issues at the hospital with patient care and the overnight events with the person on call. We share interesting patient stories and Xray images from the day before. Today, the gynecologist shows CAT scan images of the huge ovarian mass that he will try to remove today in the OR. 8:40 AM the meeting is adjourned and I make my way down to visit my sick patients that are hospitalized. 1st a 63 year old lady who has a belly full of fluid either because of tuberculosis or advanced cancer, I explain to the family that the reason why she has fluid in her belly is most likely advanced cancer and that we are still waiting on some tests. I rack my head as to how I can alleviate her nausea and pain in the meantime. The family tells me how they do not have money to pay a huge hospital bill, I assure them that we will work it out with them and will accept whatever funds they can scrape together. My second patient is a 16 year old young man who has come in because he can no longer afford doctors’ visits and has stopped taking the medicine that is keeping him alive. He came in bad shape but since we have restarted the medicines, he is looking much better. He has an undiagnosed bleeding disorder and has come to our hospital as a last resort. I explain to him that we will send him home with the medicine and see him back in one month for more testing. I hope I am able to diagnose his condition with less than 50 dollars in testing which is a fortune for this family. I glance down at my watch and am alarmed that it is 9:15 and clinic has already started. The long line of patients outside the hospital this morning has gone through a raffle and 100 patients have been selected to be seen by the docs this morning in clinic. An older male that wobbles into my office with chronic knee and back pain from working the fields, I order xrays and tell him that we can inject his knees if he would like relief for a few months. A 43 year old lady with horrible varicose veins, when I examine her she has a huge abdominal mass extending up from the pelvis past her belly button. Given the huge varicose veins I am sure that this mass has been there for a while and warn her that we need to find out what the mass is so I send her for ultrasound hoping that it’s something other than cancer. A 10 year old girl that the mother is convinced has no appetite. She says, “my daughter won’t eat anything I put on her plate.” Typical complaint for many of my pediatric patients. I plot the kid’s height and weight on the growth chart and it turns out she is the perfect height and weight for her age. Mothers here believe that chubby and overweight is healthy. An add on case of a young girl who just fell off the hospital playground and is not moving her left arm. A 6 year old boy with a horrible rash all over his body that started 3 years ago on his waist and spread everywhere. Literally all over his body. I have not seen anything like it except eczema. I quickly go find a fellow doc and ask him to take a look. The doctor mentions that this is what 3 years of untreated scabies looks like. I feel bad because the boy looks so uncomfortable and itchy. I reassure the mother that this rash is treatable and will be gone in less than a week with the treatment. Present for 3 years and gone in a week… incredible. An add on case of domestic violence. Even though we called the police to come to the hospital for a report, they didn’t show up to take it. The husband had brought his wife in because she had shortness of breath and rib cage pain since he hit her a few days ago with a chain out of anger. This was tough because of the lack of justice for women in Peru’s society. I mentioned in front of the husband that this was unacceptable, but just felt like I was just blowing smoke in the wind. A few patients with headache and constipation from not drinking enough water and also heartburn (these complaints are present most of the time). 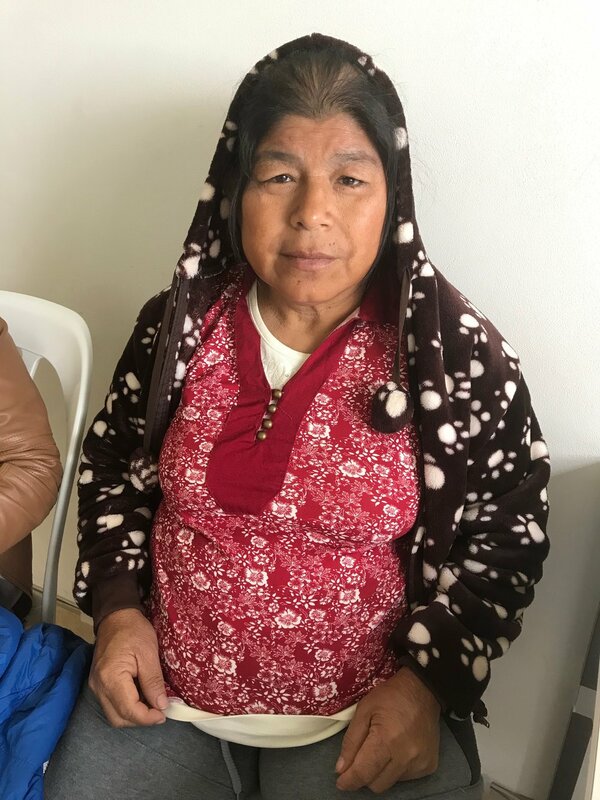 Finally as I am seeing my last pediatric patient, the mother starts crying and implores me to take a look at her as well because she has an undiagnosed disease that has been affecting her for years with yellowing of the skin, liver failure, and full body itchiness. I agree given the condition she was in and send off some special labs. 1:45 PM Lunch is a much needed break. I get to meet up with Devyn in the caf and eat a huge plate of food (including Devyn’s extras, she calls me her garbage disposal), stare out the window, make small talk with the rest of the hospital folk, and usually grab a quick coke or a coffee back at the guesthouse. In the afternoon, I finish by going over all the lab results and see all my return appointments, informing each patient of their final diagnosis and treatment. One lady, a new diagnosis of diabetes. After tearing up, we prayed that God would heal her body and that she would make the right lifestyle choices to fight this illness. Later on, while I am still seeing my patients, the gynecologist calls me over to see the results of the ultrasound of the abdominal mass form the lady with the horrible varicose veins which turns out to be a 20 week pregnancy!!! I leave the room smiling and laugh in relief. Wow!!! I knew I should’ve sent a pregnancy test on that lady, even though she told me she was menopausal. As I finish up seeing all my patients and do a couple knee injections, I try to finish up all of the rest of the paperwork from the day’s work. As I am about to finish up, the nurse knocks on my door, notifying that an emergency has come in, a lady in her middle age with unstable vital signs from diarrhea and dehydration. I quickly go to see her in the front of the clinic, order labs, meds, and IV fluids, and tell her I will check on her later. After the emergency patient, I quickly finish the rest of mypaperwork and then I visit the lab to ask them to please send a tube of abdominal fluid of my hospitalized patient to Lima for tuberculosis testing (right in the nick of time before the lab closes). Finally, I check beck on the patient with diarrhea, she is doing much better and no longer vomiting, she can go home without staying the night in the hospital. Then I check on my hospitalized patients one last time before leaving the hospital at 6PM, making sure no last-minute changes need to be made to their medical care. It is starting to get dark. 6:40 PM Once back at the guesthouse, I give Devyn a kiss and hug. She has also had a busy day, we talk about how we get to have a date night tomorrow. Then I leave for a bit to go down to take our clothes off the lines where they were drying and look towards the hospital to see that the lady in her 30s that was in the ICU for poisoning has passed away this afternoon. Her family all crying as her body being loaded into a casket and into the bed of a pickup truck. Several of her family and community members have come to pick her body up. I take a break from getting the clothes and walk over to help. The family is so grateful for the hospital and how they cared for this woman in her last days. I pray with a couple family members who are crying before they leave. Even though I was not part of this woman’s care at the hospital, they continue to thank me for being there and helping out. As I walk up the stairs back to the guesthouse I stop on the stairs to cry for a minute. I ask God to be with the family and ask Him to make something beautiful of this horrible tragedy. Thank God it is Wednesday, because on Wednesday night we watch Survivor at 8 PM. Something like the 35th season now. We meet up with the other American couple and log in online to watch. It is strange how we also feel a bit isolated and stretched by our conditions just like the people on TV. It feels good to watch the American commercials. After Survivor Devyn and I make it back to our room to get ready for bed. We make sure to finish talking about our highs and lows for the day. The way she steadies me is incredible. I am so thankful for her. Quick shower and bedtime it is. Needless to say, working here has been exciting, exhausting, and extremely fulfilling all at the same time. Since then I have already made adjustments to keep a sustainable pace here in Peru. Please pray for the hospital and the thousands of patients that come every week. Please pray for strength and sustainable practices in rest and refreshment as Devyn and I give ourselves to serving the people of Peru. We love you guys so very much, know that we appreciate every investment you have made to support what God has been doing through us here in Peru. This patient with thinning hair and doughy skin, came to me with fluid around her heart, all because of low thyroid. This patient has a scarring skin/organ disease called "Scleroderma". Diagnosed on first impression, this lady is now taking the medication she needs that will hopefully stop the scarring from worsening. Another picture of her fingers which have scarred down and now she is unable to freely move them. Poor dental hygiene is super common here, the mom said "she just doesn't like brushing her teeth." After a pep-talk with the mother, I sent them over to our dental clinic. This little boy has a small left eye that is blind, most likely from birth. Many of the cases here are too advanced to fix. He will never be able to see from that left eye. But he's still a really happy kid and loved taking pictures. 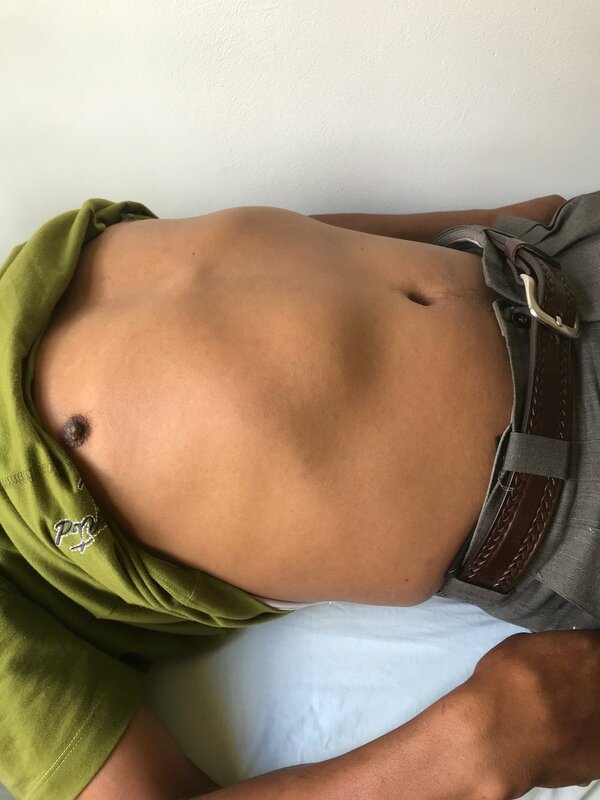 This patient's liver is sticking out of his belly. He ended up having a parasite infection of his liver. We are treating him with meds, eventually he will need surgery. This patient has a split uvula as seen in the photo. This is what subtle cleft palate looks like. He could not speak well so I referred him to ENT and speech therapy.